Chinese across the world will celebrate the Year of the Pig on Tuesday. Whether you are still in the office working to complete the assigned task at the last minute, or traveling back home, or sitting by the fireside with your family, we wish you a happy Lunar New Year. Things have changed dramatically in recent years. Gone are the days when people longed for Lunar New Year to enjoy good food, considered luxurious for the rest of the year. Yet attending or organizing parties is still an indispensable part of the festival. 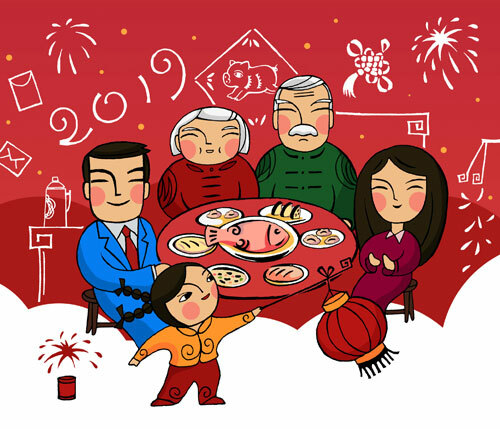 In these times of fast-paced urbanization, Lunar New Year is almost the only occasion for people to meet their childhood friends and share the memories of the days gone by. Gone are the days when people worked or studied just a short distance from home and could meet family and friends as often as they wanted. Uncles, aunts, and cousins, these words are getting increasingly more distant. The frequency of mutual visits has dropped to almost once a year－during Spring Festival. Gone are the days when firecrackers and fireworks were a main attraction of the festival. Nevertheless, the joyous atmosphere remains. Mutual tolerance reaches its peak during Spring Festival. And quarrels can be quickly ended by uttering a simple sentence: "Come on, it's the New Year!" Among all the unchanged things, family reunion remains supreme. After a whole year of hard work, nothing is more relaxing than a cup of tea with dad, and nothing warmer than a hug from mom. The road home has become easier to travel. Yet, compared with just a decade ago, when people had to line up at a train station at midnight to get a ticket home, today one can easily book a ticket for a high-speed train, flight, or a long-distance bus by simply tapping a key on the smartphone. More forms of family reunions have emerged. Increasingly, more parents travel to big cities where their children work to enjoy the festival with them. "Spring Festival travel rush the other way round"－a newly coined phrase－appropriately describes this new phenomenon. Amid all the joys and laughter that Spring Festival brings, our highest respect should be reserved for those still working at various jobs. Millions of police officers are still at their posts during the festival. Millions of doctors and nurses, especially those in the emergency wards, still have to report for duty, ready to save every life. For the about 2 million railway employees, Spring Festival means more work and greater pressure than normal days, because they have to ensure the safety of hundreds of millions of passengers on their way home and back. The deliverymen and shop attendants, too, have to work to ensure the supply of fresh vegetables, fruits and meat. And then there are the water supply department employees maintaining an uninterrupted supply of water, the gas stations attendants serving drivers, and the hotline operators of public utility companies providing 24-hour service. There are many more people like them. It is the efforts of these people that make family reunions for other people possible, and we thank them from the bottom of our heart. The history of Lunar New Year dates back to 3,000 years. Yet it was in 1980 that the term "Spring Festival travel rush" first appeared in official news reports. It is China's fast-paced economic growth and urbanization leading to unprecedented economic and social progress that prompted people to work far away from home. In the future, with more migrant workers becoming urban residents and more talents finding home in the cities where they work, the Spring Festival travel rush will hopefully become history. And people can enjoy family reunions more easily, not only once, but many a time in a year.